Title: "African Twilight: The Vanishing Rituals and Ceremonies of The African Continent"
For the last 15 years of their four decades of African fieldwork, world-renowned photographers Carol Beckwith and Angela Fisher have continued their journey across Africa, seeking out even more remote communities to record the sacred ceremonies, powerful art forms, and boundless creativity of the African Continent. 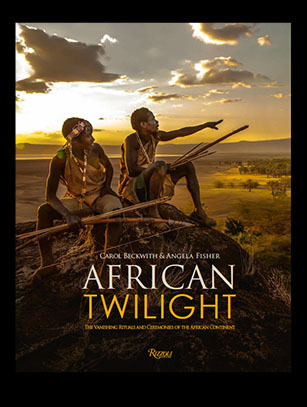 Now, nearly two decades after their landmark book 'African Ceremonies,' 'AFRICAN TWILIGHT: THE VANISHING CULTURES AND CEREMONIES OF THE AFRICAN CONTINENT completes the journey, covering disappearing rituals and ceremonies from some of the most inaccessible corners of the African continent. Simply put, no other book like this exists or can ever be created again, as more than 40 percent of what has been documented here has already vanished. ORDER now! 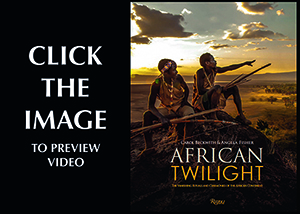 Click the image below to preview footage from "African Twilight", ceremonial African dance from recent fieldwork © Carol Beckwith & Angela Fisher.